These are transmitter repeaters that can be added to LRS pager systems to increase their range. Order this as part of a custom system or to expand your existing system. LRS repeaters can repeat signals indefinitely, giving LRS the best range in the industry. 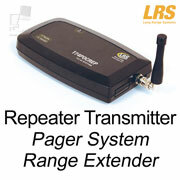 These are transmitter repeaters that can be added to LRS pager systems to increase their signal range or coverage. Order this as part of a custom system or to expand your existing system. You can call us at 805-375-7000 to ask questions or place your order, or you can order your system components using the Add to Cart button above. Expand coverage between buildings and across campuses. Create wireless connections to rooftop antennas. Greatly increase the range of single or multiple small push-for-service transmitters. Overcome coverage problems which may be present in large, very solidly constructed buildings such as hospitals or high-rise office buildings. The larger LRS pager transmitters (models T7470, MT and EZ) have ranges up to 3/4 mile in open air and do not require repeaters in normal use. However, repeaters are often used to reinforce signals from small LRS push-for-service transmitters such as the Butler XP and PRONTO models. These have ranges of a few hundred feet on their own, but that can be greatly increased with repeaters. When repeaters receive low-power signals from small transmitters, they repeat the signals with many times more power than the original signal. One repeater can service as many transmitters as it can "hear". 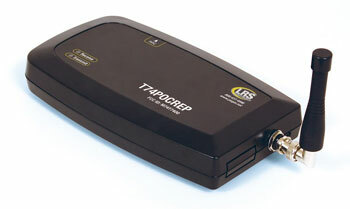 LRS repeaters simply repeat any LRS transmitter signals they receive. When repeaters are placed near the maximum range of original signals, they repeat the weak, distant signals with new, full-strength signals, thereby extending the range of the original signals. The original signal can be from any LRS transmitter or even another repeater. You can spread out repeaters in such a way as to send signals over a network of repeaters to eventually cover very large areas. A large hospital built of heavy concrete and steel, with six floors above ground and three below and covering most of a block, has a clinic on the ground floor. The clinic needs to page patients anywhere in the building and throughout the grounds. Two repeaters are placed on middle floors at the ends of the building to provide coverage within the building. A third repeater is placed on the top floor with a connection to a large antenna on the roof to provide coverage for the hospital's upper floors, grounds and beyond. LRS transmitters normally use a 3-inch antenna mounted on the transmitter itself. There is an optional seven-foot antenna which can double the range of the 3-inch. The larger antenna includes a 25-foot cable. Cable lengths beyond 25 feet reduce the range, which is one of the reasons a repeater is connection to the roof antenna instead of running cable all the way from the ground floor. Repeaters are usually just placed in utility closets and plugged into wall power, need no special setup or ongoing attention from users, and it's usually just that simple. Locating the repeater is the key to optimal performance. Ideally, repeaters should be located at the sweet spot where source signals are as weak or distant as can be yet still received reliably. The only way to know where this is is by trying different locations. As is true for all radio equipment, keep the following in mind to optimize performance. Note that the following applies to the location of the antenna rather than the electronics box itself. The antenna can be separated from the box with a cable so the box can be in a convenient location while the antenna can be elsewhere where it works best. Radio signals love height; higher is always better. The roof is ideal but upper floors near windows are good or near the ceiling is OK if that's all you have to work with. Radio signals do OK with windows, light construction and empty space. In a standard low-rise building of wooden or cinderblock construction with lots of windows and open spaces, radio does fine. Radio signals do not like metal. Keep antennas as far away from metal as possible, especially sheet metal. Do not locate antennas in places surrounded by metal or on top of metal surfaces such as steel desks or cabinets. If your building has sheet metal walls, locate antennas so they can "see" out windows or better yet, mount antennas outside of the building.